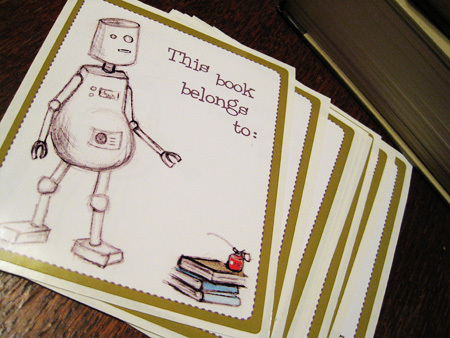 I’m very pleased to announce the latest addition to the shop – bookplates! With ROBOTS on them!!! I’ve been playing with layouts for bookplates and researching printers for months now and I couldn’t be more tickled with these little guys now that they’re here. I played with digitally coloring in the robot or painting him in real life, then re-scanning, but ultimately I decided I really like the chicken scratch marks of my pencil sketch. I think it sweetly compliments his high tech nature. And his pudgy belly. You can get your very own set of 8 bookplates, personalized with your name (if you wish), right here.